For this new collection, Saatchi Art Assistant Curator Jessica McQueen drew inspiration from the radiant hues of fall foliage—amber, scarlet, and gold—that lend homes a cozy, luxe sophistication year-round. 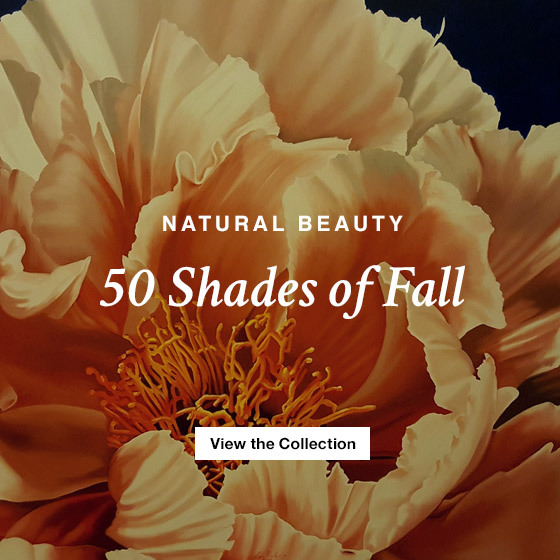 Savor nature’s beauty and find the perfect new addition to your home in Fifty Shades of Fall, highlighting abstracts, portraits and landscapes in a vivid autumnal palette. Diplomato presso l’Istituto Statale d’Arte di Chieti (CH). Ha frequentato l’Accademia di Belle Arti L’Aquila (AQ) con i maestri: Gino Marotta, Mario Ceroli, Carmelo Bene, Piero Sadun, Silvano Bussotti, ecc. Ha frequentato la facoltà di Architettura “G.d’Annunzio” Pescara/Chieti. E’ stato docente di Decorazione Pittorica presso l’ Istituto Statale d’Arte di Chieti e Lanciano, specializzato in “Decorazione e Stampa del Tessuto”. E’ Architetto libero professionista nel campo della ristrutturazione architettonica antica ed arredamento d’interni. Luigi De Rubeis graduated at Chieti Institute of Arts and attended the Academy of Fine Arts in L’Aquila with the maestros Gino Marotta, Mario Ceroli, Carmelo Bene, Piero Sadun, Silvano Bussotti, just to name a few. Thereafter he attended the Faculty of Architecture at “G.d’Annunzio” University in Pescara and Chieti. A Decorative Painting teacher at the State Art Institute of Chieti and Lanciano, specializing in “Fabric decoration and printing”. He is a freelance architect in the field of ancient architectural renovation and interior decoration. His passion for painting begun in childhood when uncle Angelo gave him a box of oil paints and since tthen he has not stopped persuing his passion.